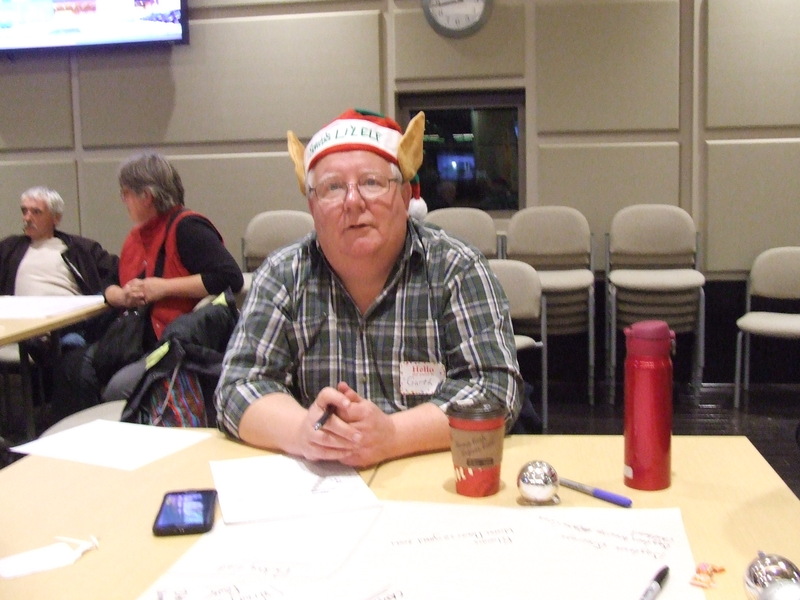 Three kinds of hats symbolized Sackville’s strengths, weaknesses and opportunities as a dozen residents gathered Monday night at town hall around tables loaded with balloons, candies, coloured markers and big sheets of blank paper. Consultant Tyler Mattheis handed Sharon Hicks, the scribe at the “strengths” table, an orange hard hat while April MacKinnon donned a black pirate hat as scribe at the “weaknesses” table. Mattheis said that opportunities are like gifts that need a little bit of help. “Who gives help to the world’s best gift giver?” he asked. “Santa’s elf,” he answered, handing Garth Zwicker a red and white elf’s hat at the “opportunities” table. Over the course of the next 90 minutes, the participants moved from table to table discussing and writing down their ideas as Mattheis, Deputy Mayor Ron Aiken and a trio of town managers mingled among them. 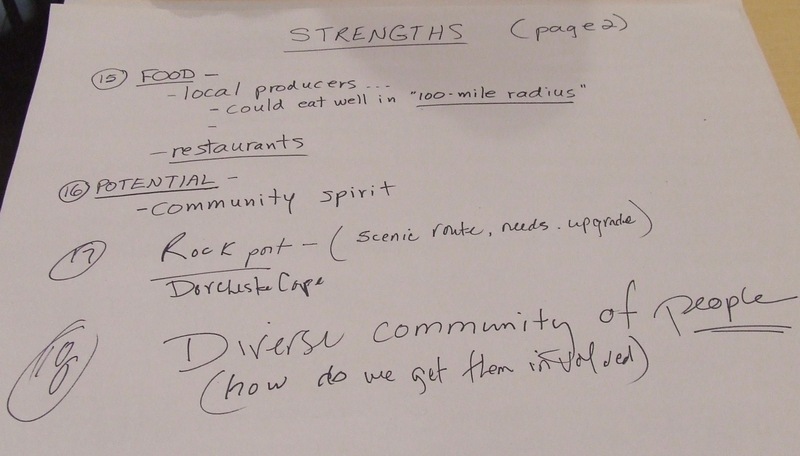 The exercise was part of a process to come up with a new business development strategy for the town. In August, councillors awarded a $17,250 contract to Mattheis’s Nova Scotia consulting firm, 4/L Strategies, to develop the new business plan in partnership with Lions Gate Consulting of Vancouver. 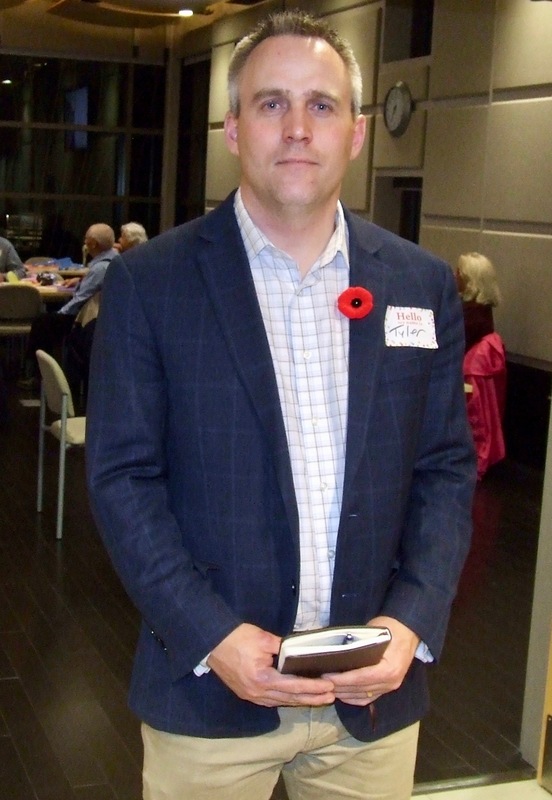 Mattheis is also Director of Economic and Business Development for the Municipality of East Hants in Nova Scotia. Aside from Monday’s public consultation, Mattheis has been conducting research on the town, reviewing its organizational structure, talking with town managers, Opportunities New Brunswick and the group promoting development at TransCanada highway exit 506. He says he will be interviewing local business leaders before presenting a final report to town council in December. 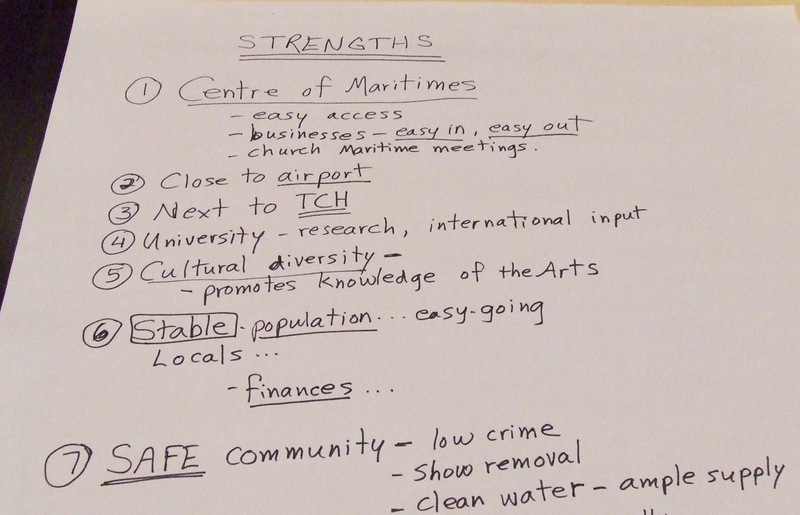 The 12 participants in Monday’s public consultation listed many town strengths including Sackville’s location in the centre of the Maritime provinces, its stable population with “easy-going locals,” cultural diversity and the presence of the university. Weaknesses included flooding and climate change, lack of public awareness about the importance of supporting local businesses, lack of local support from the planning commission along with rigid zoning and high rents for commercial properties. 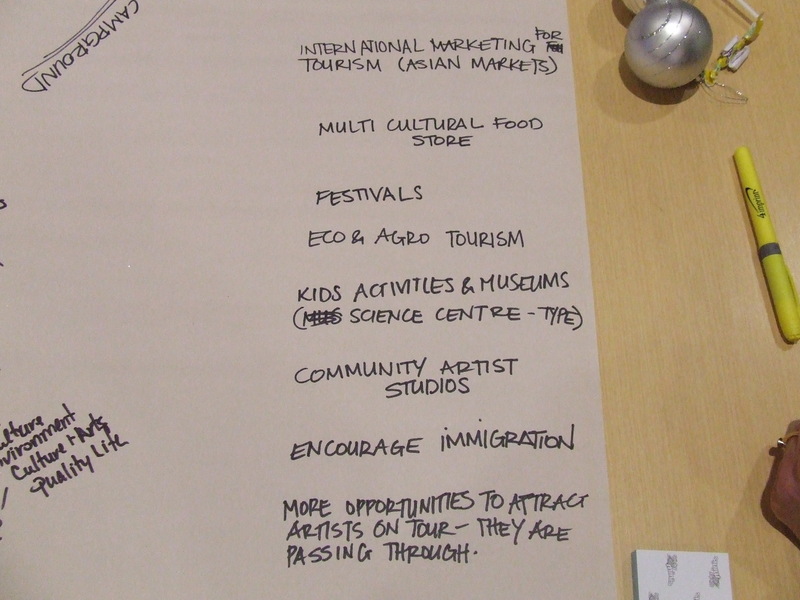 The participants found opportunities in marketing eco and agro tourism attractions in Asian markets, encouraging immigration, a multi-cultural food store, community artist studios and more collaboration with Moncton, Riverview and Dieppe. This entry was posted in Town of Sackville and tagged 4/L Strategies, April MacKinnon, Garth Zwicker, Lions Gate Consulting, Sharon Hicks, Tyler Mattheis. Bookmark the permalink. Wow! 12 participants acknowledged “Cheap Tuesdays” at the Vogue as one of our strengths. I am sure Google and Amazon will be beating at our door when they hear the news. We are nice, what went wrong? There are some key points not mentioned in this article. First of all not all the talk was around arts, culture, environment, eco tourism. At the tables where I sat these came up very little. Central distribution centers, shopping destination with highway development similar to Masstown were talked about. Land access for development or lack there of. Access to a skilled work force, coordination of efforts with Amherst for economic growth. No voice for retail to help lobby for services to support retail growth. The need for mentor access to help understand and navigate avenues to get a business up and running in Sackville. The fact that only retail was at the discussion table with no representation from companies such as Moneris, Cam-tram, Compact Appliances, AIL and other employers that have the employment base that provides the salaries that support retail. The university being a vehicle to spawn economic opportunity. Example MTA alumni own Terra Beata and chose to locate their expansion in Sackville. The difference between community development and economic development. The change of mandate of Renaissance Sackville from a economic development mandate to community development. It was a great session that provide a good balance on perspective. Touching on blue collar, white collar, plaid collar,academia. Thanks Bruce.. I appreciate your thorough consistent coverage of the sh*tshow. Well, things are going from bad to worse – three comments on Bruce’s latest article, and not one of them had the courtesy or courage to use their actual names – instead they hide behind aliases. I urge you folks to actually acknowledge who you are when you comment on an article, or on other readers’ comments – otherwise readers will probably assume that you are just cranks and windbags – hmm, maybe that’s actually the case. When setting up an account for WordPress it asked for a user name. I chose this name as it has a personal meaning to me. I have no issue in identifying myself when it comes to commenting on any posts. As well Mr. Wark does a great job of monitoring comments and ensuring nothing is posted that is not respectful. My name is Shawn Mesheau, I participated in the session Monday evening and felt it important to share what was discussed that Mr.Wark was not aware of as he was an observer and wasn’t in on all discussions. There was a great turnout and good discussion. I hope it helps in coming up with a much needed plan to ensure Sackville does not go the way of the dinosaur and become extent like several other communities have faced in recent years. Thanks for the additional information on the session at Town Hall and for your participation and interest in keeping our town of Sackville a vibrant community. I just find it irritating when people post critical comments and don’t have the courtesy to identify themselves when doing so. SWOT analysis, developed in the 1960’s gives the perception of rigour while providing few actionable insights. Another SWOT analysis, with a different group of people, would yield different results and recommendations. It seems the town is getting what it paid for — very little. These are just two of my professional contacts. In a networked world, we need networked approaches to making decisions. It’s time for Sackville to get out of the 1960’s. Sending out a boiler-plate RFP only gets you boiler-plate responses. In complex systems, best-practices are useless. We need to develop emergent practices based on the unique context here and informed by a global network. Sounds like a great job for Renaissance Sackville to take on. The yearly Renaissance Sackville budget (25K) is about what these consultants were paid ($17K). I am currently working on a similar initiative, but much broader, for the Prime Minister’s Office of Finland. We do have some local expertise. What is your point in comparing the budget of Renaissance Sackville to the tender amount? The suggestion was made that Renaissance Sackville do this work. My point was to show that it would be almost their entire yearly budget. RS has much other good work to do. I sat on its board for seven years. In reviewing a previous comment about Sackville needing to get out of the 1960’s it brings about a thought that more balance is needed in our community. Yes things have changed and yes we have to embrace change. However, looking to the past may actually help us plan for the future. The word consultant was likely one rarely used in 1960’s Sackville. Consultants then came from within our town at no charge to taxpayers because they felt a community responsibility. Representatives from plaid collar, white collar, blue collar and academia. People who laid the ground work for the future of Sackville as a balanced approach. They did so with no compensation in mind. We have the knowledge base within our community now to forge ahead without influence of political will. Yet for some reason we continue to believe our municipality is the gate keeper to set it up. The will must come from the people with no agenda other then to grow a balanced community for tomorrow. No one person or perspective is any more important then another. Plans spawned by sector representatives from tourism, retail/business, agriculture, environment, culture/arts, quality of life, MTA Student Union, MTA admin would provide the balanced approach. A group was formed in 93/94 to address the loss of economic opportunities in Sackville from the closure of Atlantic Wholesalers, the move of the RCMP and animal pathology labs as well as the swing away from manufacturers such as Enterprise Foundry. 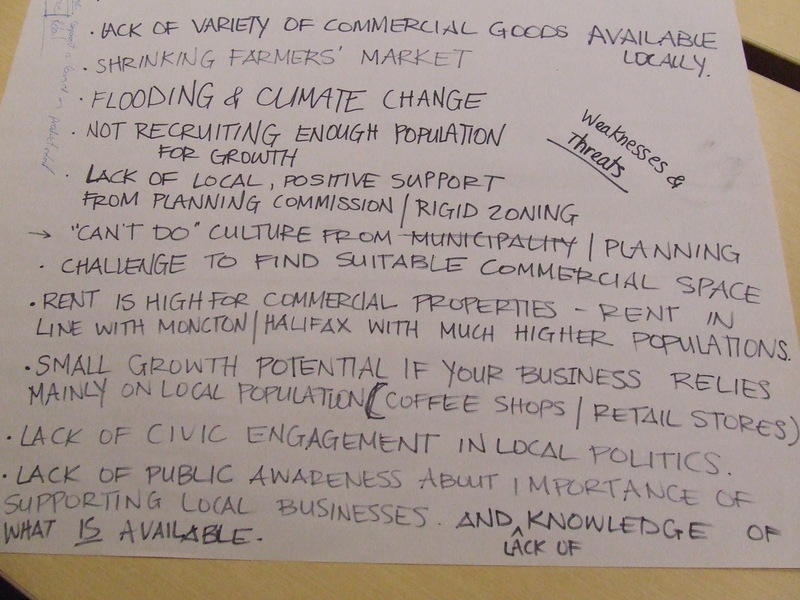 Their approach was a balanced Sackville with representation from all these sectors. It is time to rejuvenate this balanced approach. Thank you, New Wark Times, for the report “Sackville residents list strengths, weaknesses, and opportunities for new business plan” posted on October 30th. At the Sackville Town Hall, there must be a sagging shelf of boxes of consultants reports on this very same or similar subject. Members of the public give their time and thoughtful responses and do rotating table discussions and fill out large pieces of paper. And another proverbial box goes on the shelf. Public consultation is a very democratic idea. More consultant fees are paid and more town employees are paid to review the results. Town Council feels they have done something. I would love to point out that the Sackville Heritage Bylaw was developed with the help of many years of volunteer hours of work by citizens and believed to be very important (critical) to community and economic (and business) development by the Town of Sackville, and Renaissance Sackville. That whole huge effort has recently been tossed in the garbage can. I understand that it is now under review. Here is a hint… until the elephant in the room is included and committed in a plan for important Heritage protection, even a well-reviewed plan will likely have a hard time to succeed in this town. This has been said from the beginning. To revisit, yet again, the fairly recent legal action of Louis Belliveau vs. Town of Sackville where a town citizen volunteers his time and expertise to sit on a committee called The Sackville Heritage Board. Mr. Belliveau joined other citizen volunteers on this committee who believed in the mandate to protect the heritage character of the streetscapes of Sackville. Mr. Beliveau was dragged through the New Brunswick legal system, at his own expense, for two years. He had made personal comments of concern about the treatment and pressuring (bullying) of the Heritage Committee by Town of Sackville representatives. And after the whole legal fiasco came to an end, Mr. Belliveau was being sued for costs of an unprecedented $14,000 for the Town of Sackville. Volunteer? Why? As for a business plan, Sackville has not had a vibrant Chamber of Commerce in the 20 years since I moved back here. There are a handful of small business owners who keep valiantly trying with events like Midnight Madness. 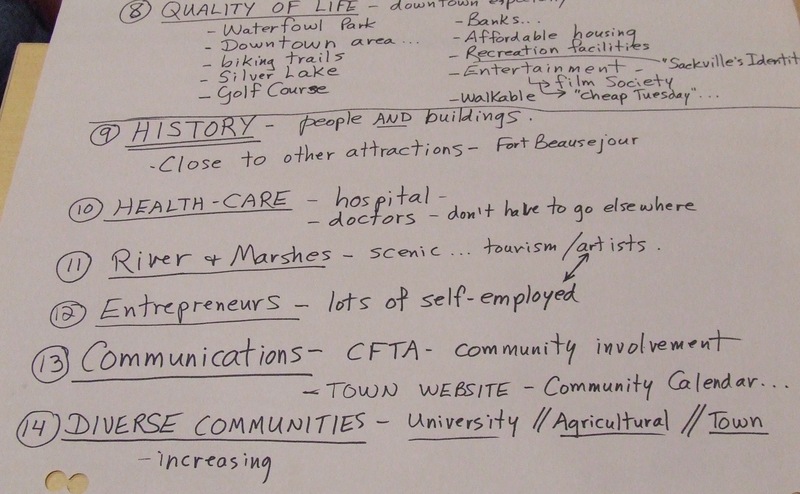 Perhaps this “business plan” should be to create a vibrant Chamber of Commerce that would support and drive the development of business in Sackville. In other communities and countries, The Chamber also runs the tourism program. It would seem that local business could breed local business with good support from the Town. Hats and balloons and candies? Seriously? Where the heck are the party favours? What a great suggestion Meredith– the need for a vibrant Chamber of Commerce! Thanks also for the reminder about the incredible saga of Louis Béliveau with the Town of Sackville from which we learned that our legal system is far from being independent, as it should ideally be in a democracy (at least in this case). Of course, such independence may be hard to ensure in a complete manner at all times (perhaps especially in a very small province where everyone is almost related to everyone). Despite (or because?) of this, we should always aim for this ideal… or else we risk saying good-bye to Justice for good one day. This is my non-expert opinion about the legal system in a democratic society on this special day (Happy Birthday Louis, if you will read this :); eager to start flying back home! ).